Warranty: 3-year u. S. Warranty guards against manufacturer defect. Savor the luxurious feel of vacation-worthy bedding designed for all seasons. 8 sewn-in corner tabs securely keep your favorite duvet cover in place. Mid-weight, box-stitched comforter prevents shifting or clumping for premium comfort. Enjoy a hotel-style plush comforter for your bed without the five-star price. The WEEKENDER Quilted Down Alternative Hotel-Style Comforter is hypoallergenic and can be used as a duvet insert or a stand-alone comforter. Savor the luxurious feel of vacation-worthy bedding designed for all seasons. 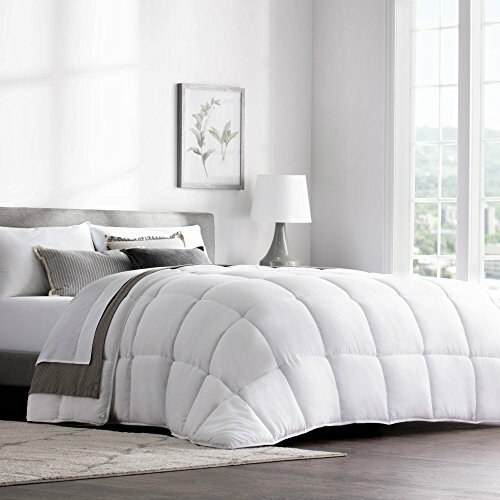 You will love our extra features that set this comforter apart from the rest: corner duvet tabs keep this comforter and your favorite duvet cover secure and hassle-free, box stitching keeps the ultra-soft microfiber fill from shifting or clumping, and you will never have to worry about dry cleaning thanks to our machine washable and dryer safe construction. Full measurements are 82 x 86 inches. Warranty 3-year u. S. Warranty guards against manufacturer defect.